Fruit; small, concial, five-sided and ridged. Skin; orange streaked with deep red, patches of russet on one side. Flesh; yellow, firm, juicy, rich, sugary, with a powerful aromatic flavour. [HP pl.XLI/1878]. 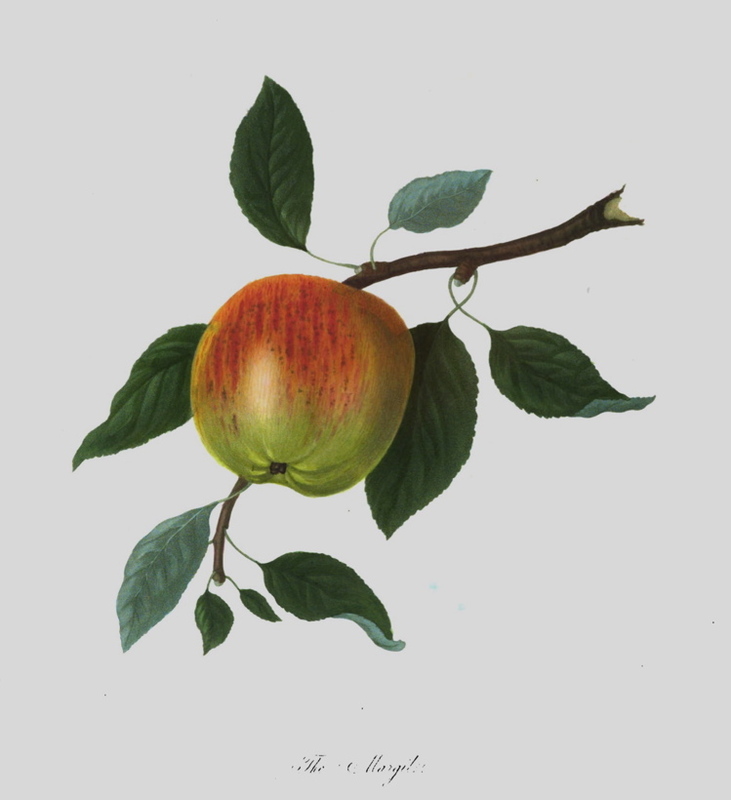 ‘This Apple is very generally cultivated in the gardens about London, and is deservedly held in much esteem, being excellent both as a fruit for dessert, and for every culinary purpose: it does not, however, possess sufficient beauty to become a favourite in the London Market, where intrinsic merit too generally yields to appearance as a criterion of the value of fruits. The author has not been able to obtain any satisfactory account, either of the origin of this variety, or of the date of its introduction.’ [PL pl.33/1845]. ‘There seems to be no record of this variety before the publication of the Pomona Londonensis, although it was known for many years previously. Rogers says, he saw a tree of it growing as an espalier in the garden at Sheen, which was planted by Sir William Temple. I find it was cultivated to a considerable extent in the Brompton Park nursery, so early as 1750; it must therefore have been well known at that period; but I cannot discover any trace of its origin. It may have been introduced from the continent by George London who was for some years in the gardens at Versailles under De Quintinye, and afterwards in partnership with Henry Wise as proprietor of the Brompton Park nursery, as the name seems to indicate more of French than English origin.’ [Hogg p.134/1851]. PB pl.LXXXVII/1812. Listed in the 1850 and 1857 catalogues [Apple no.38/1850].